Vancouver, British Columbia--(Newsfile Corp. - November 29, 2018) - Dunnedin Ventures Inc. (TSXV: DVI) (the "Company" or "Dunnedin") today announced it has entered into a purchase agreement to acquire 100% ownership of the consolidated Man, Prime and Dillard properties, the "MPD Project", in south-central British Columbia. 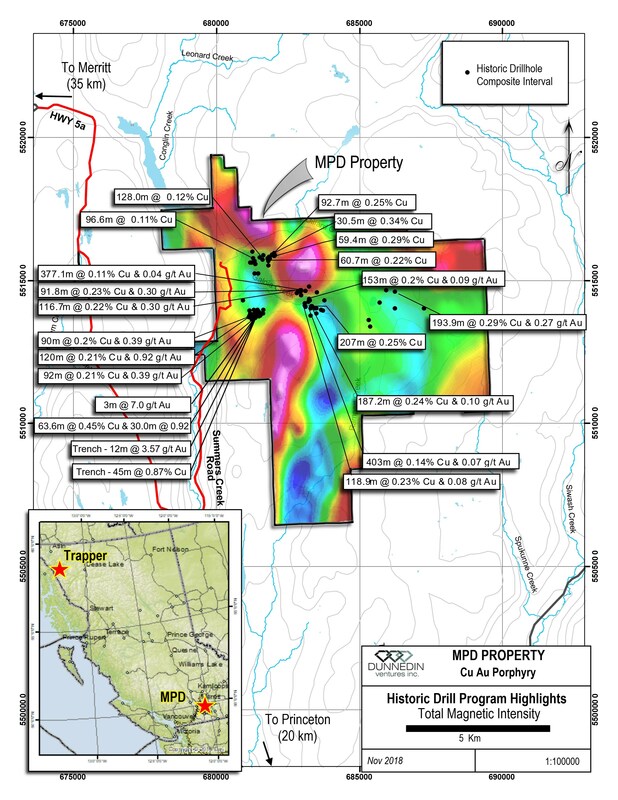 The MPD Project is an excellent strategic fit with Dunnedin's 100% owned Trapper copper-gold porphyry project ("Trapper", see news release November 27, 2018), located in the northern Golden Triangle area of British Columbia and joins this project to form a strong copper-gold porphyry portfolio that has the potential to stand alone from Dunnedin's Kahuna Diamond Project in the future. Claudia Tornquist, President of Dunnedin said, "MPD is a quality project with immediate exploration upside and the potential to yield a major copper-gold porphyry system. We are genuinely excited about this asset and pleased to have secured it on favourable terms. Our philosophy in the Discovery Group of companies has generated industry-leading returns for shareholders over the past year at Northern Empire Resources and Great Bear Resources. This philosophy can be summed up as finding and advancing known mineral discoveries that are undervalued, but with strong economic potential. These projects have geological characteristics that can drive rapid value growth for investors when modern exploration methods and management's experience is applied. Dunnedin's new MPD project has these attributes and could mirror these recent successes in 2019." Further details of the MPD and Trapper copper-gold porphyry projects are provided on Dunnedin's web site at www.dunnedinventures.com. Technical information will be updated as recently acquired historical data are evaluated. Management cautions that Dunnedin has not performed any exploration on the MPD Project to date. Historic information reported herein was obtained from publicly available sources and industry related reports. This news release contains historic data that Dunnedin believes to be from reliable sources using industry standards at the time, but the Company has not independently verified, or cannot guarantee, the accuracy of the information disclosed and readers should use caution in placing reliance on such information. Comparisons to adjacent or similar mineral properties, deposits and mines are provided for information purposes only. Dunnedin has no interest in, or rights to explore or mine any such properties and references to deposits and reserves reported herein are not indicative of deposits or results obtained on the Company's properties. Dunnedin Ventures Inc. (TSXV: DVI) is focused on its 100% owned, advanced-stage Kahuna Diamond Project in Nunavut which hosts a high-grade, near surface inferred diamond resource and numerous kimberlite pipe targets. The Company holds diamond interests in 1,664 km2 of mineral tenure located 26 kilometres northeast of Rankin Inlet and adjacent to Agnico Eagle's Meliadine gold mine. The Kahuna Diamond Project has an Inferred Resource Estimate of 3,987,000 tonnes at an average grade of 1.01 carats per tonne, totalling over 4 million carats of diamonds (+0.85 mm) (see news release dated March 31, 2015). Dunnedin's drilling is aimed at the discovery of diamondiferous kimberlite pipes, and the Company is working with advisor and largest shareholder Dr. Chuck Fipke to define and prioritize drill targets based on an extensive historic data set, and diamonds and indicator minerals recovered from a series of kimberlite and till samples over four seasons of field work. Dunnedin also holds a 100% interest in the Trapper Project near Atlin in the northern "Golden Triangle" region of British Columbia. The Trapper Project is interpreted to overlie a gold-rich copper porphyry complex having a surface geochemical, geophysical and regional alteration signature of over 15 square kilometres. Based in Vancouver, Dunnedin is backed by a world-renowned team of exploration experts with decades of combined exploration experience and significant capital market strength.